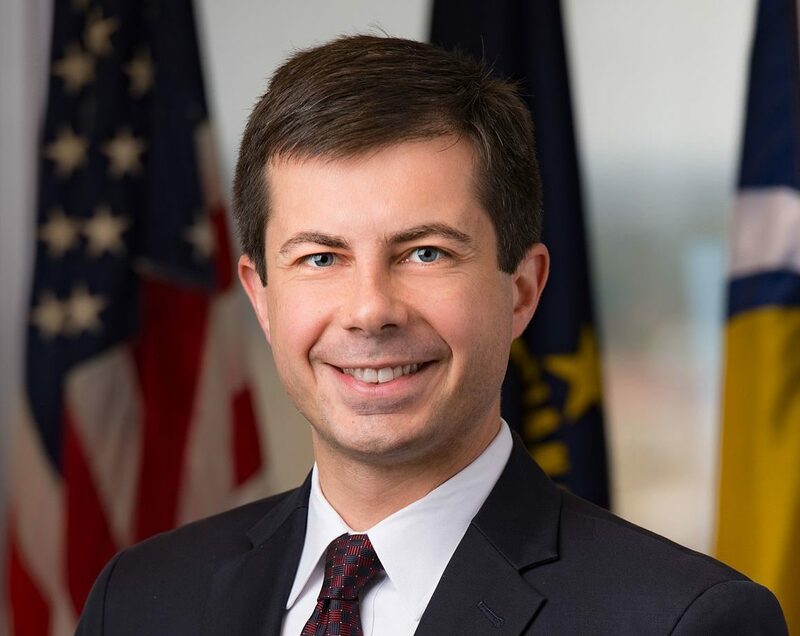 Mayor Pete Buttigieg is the chief executive of the City of South Bend. The city’s thirty-second mayor, he was sworn into office on January 1, 2012. As mayor, Buttigieg is responsible for the city workforce of over 1,000 employees and an annual budget over $380 million. Laura O’Sullivan serves as Mayor Buttigieg’s Chief of Staff. In this role, Laura advances the Mayor’s vision for the future and works to make the city more innovative, equitable, and sustainable. O’Sullivan came to the City from the University of Notre Dame, where she served as Director of Athletic Events and Stewardship, Director of Special Events and Stewardship, Program Director of Annual Giving Events, and Program and Events Coordinator for Recognition Societies. She previously served as Director of Development and Executive Director of the SMC Foundation at Southwestern Michigan College, as well as the Executive Director for the Northern Indiana March of Dimes. She is a South Bend native and 1993 graduate of Purdue University. She has served as citizen member of the South Bend Common Council Parks and Recreation Committee, Trustee of the South Bend Awesome Fund, member of the League of Women Voters of the South Bend Area, and Board Member of the South Bend Alumni Association. Genevieve Miller serves as Deputy Chief of Staff and Policy Director to the Mayor. She received her B.S. in environmental science and her M.S. in entrepreneurship from the University of Notre Dame. As a U.S. Fulbright Scholar, she also received a Master in Gastronomy from the University of Gastronomic Sciences in Italy. Genevieve previously worked as a Business Analyst in the Department of Innovation & Technology, and she also led the City’s Bloomberg Mayors Challenge team, distinguishing South Bend as one of nine cities to win $1 million for an innovative data-driven solution to address transportation as a barrier to stable employment. She serves as a board member of the Purple Porch Co-op, and previously served as a member of the City of South Bend Health & Public Safety Common Council Standing Committee. Cherri Peate serves as Director of Community Outreach for the Office of Mayor Pete Buttigieg. A South Bend native and Washington High School graduate, Cherri is committed to serve the community–a passion that spans over 15 years. She received a Bachelor of Arts degree from Indiana University Purdue University of Indianapolis in sociology; a Certificate of Completion in community and voluntary services at All Hallows College in Dublin, Ireland; and a Master of Science in public service management from DePaul University in Chicago. It was at DePaul University that she was welcomed as a member of the Golden Key International Honour Society. Cherri is an advisory board member at IU South Bend’s Center for a Sustainable Future, a member of the Young Professionals Against Poverty at the Center for Homeless, serves as co-chair and director of strategy for the Political Outreach committee for the St. Joseph County African-American Democratic Coalition (SJCAADC), and is a member of Alpha Kappa Alpha Sorority, Incorporated. Her avocations include mentoring, spending time with family and friends, and has invested years in the arts as a professional spoken word artist. Mark Bode serves the City as Director of Communications. Mark graduated from Harvard University, where he studied Government and Economics and served as the managing editor of the Harvard Political Review. He previously worked as an intern in Mayor Buttigieg’s office. He also has experience with the United States Conference of Mayors, and is a recipient of the Presidential Public Service Fellowship. Mark is a native Hoosier and grew up in Avon, IN. Jamie Morgan serves as Project Manager for Mayor Pete Buttigieg. In her role, Jamie collaborates, develops, and implements City policy, programs, and mayoral initiatives. She received her Masters of Public Affairs from Indiana University South Bend where she worked as the community organizer for the Civil Rights Heritage Center. Jamie is a 2017 honoree of Celebrating Michiana Women Leaders for her social justice advocacy. She is a Board Member at The LGBTQ Center and delights in planning South Bend Pride with their fabulous team. Prior to public service, Jamie enjoyed a career in the San Francisco Bay Area as nonprofit professional focusing on animal welfare. Yesenia Garcilazo serves as Mayor Buttigieg’s Scheduler and Executive Assistant. As Scheduler, Yesenia is responsible for tracking scheduling requests and maintaining the Mayor’s calendar; as the Executive Assistant, she is responsible for executing all official business travel arrangements, as well as organizing Mayor’s Night Out. A South Bend native and Washington High School graduate, Yesenia received her bachelor’s degree from IU South Bend in General Studies with a concentration in Social and Behavioral Services. Yesenia’s previous experiences include: billing and office management (Cash Processing Representative, Beacon Health Systems) and resolving constituents’ concerns (Secretary, Office of Mayor Pete Buttigieg). Yesenia’s avocations include providing translating services to South Bend residents, volunteering, and spending time with family. Shalon Davis has served the City of South Bend since 1998, beginning as licensing secretary for the Building Department under the leadership of Don Fozo. Shalon also worked for former Mayor Stephen Luecke. A native of South Bend and a graduate of John Adams High School, Shalon plays a vital role in resolving an array of resident concerns and managing the day to day operations of the office. Shalon also coordinates a variety of special events for the Mayor’s Office and serves as the City’s Black History Month and United Way Coordinator. Shalon is a citizen member of the Community Relations Committee for the Common Council, a member of the Board of Directors for Michiana Crime Stoppers, a board member of Mamas Against Violence (MAV’s), a committee member of the NAACP and the Community Relations Coordinator for the St. Joseph County African American Democratic Coalition (SJCAADC). She also volunteers her time and services with the annual Martin Luther King celebration, Toys for Tots and other diverse organizations throughout the City. 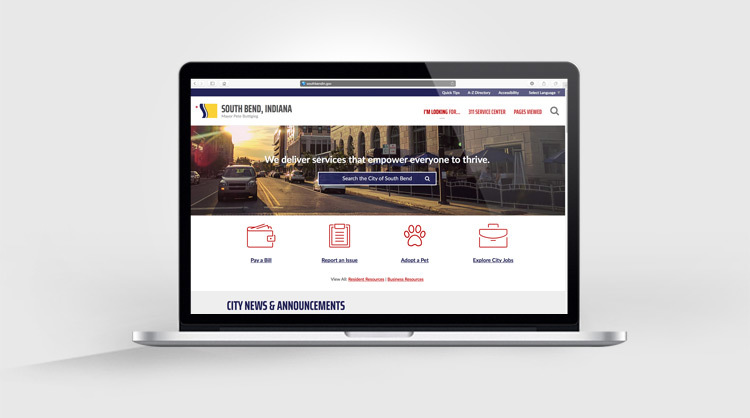 We’ve redesigned the website with an emphasis on better connecting you with services, facilities, and information pertaining to everyday life in South Bend. Click on the left and right arrows to navigate these quick tips to make the most of your first experience. 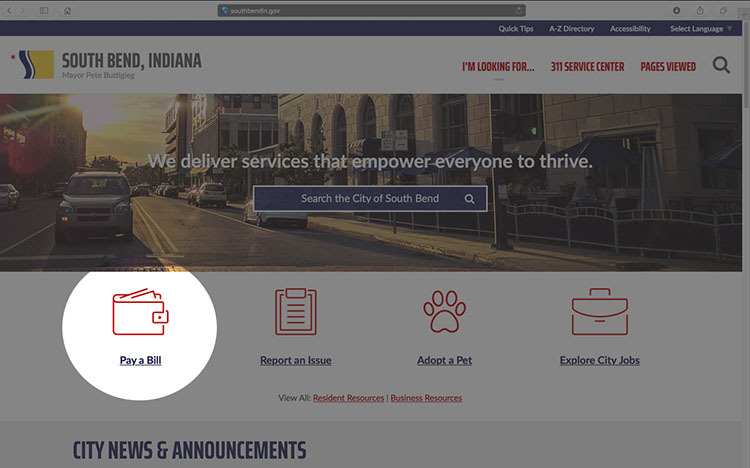 Browse topics, answer questions, and get information about City services and departments. Take me there. 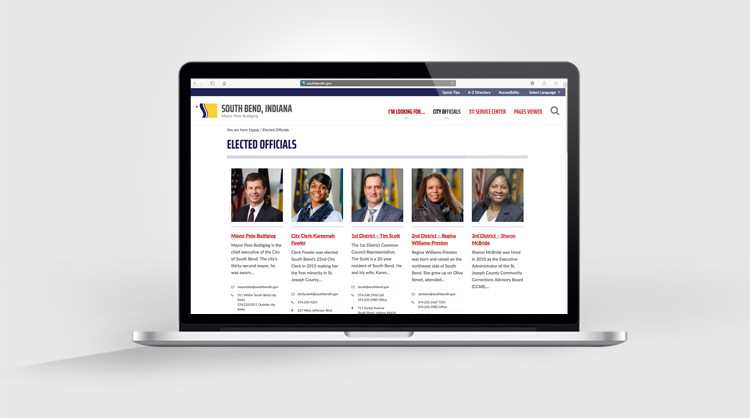 South Bend’s city government aims to make the basics easy, deliver good government, and invest in people and places. Learn about how our elected officials are working for you. Learn more. We have information on how to pay utilities, parking tickets, and more. Go pay a bill now. Get answers to common questions like like “How do I sign-up for the City Yard Waste Program?” and others via Top Resources for Residents. Learn more. 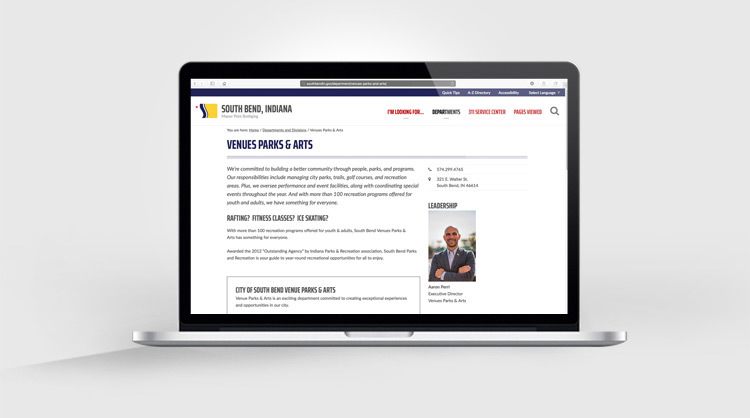 Explore activities, programs, and health and fitness initiatives through Venues Parks & Arts. Learn more. Our goal is to continue evolving this service to better meet your needs. Please provide feedback on how we’re doing at the bottom of any page. 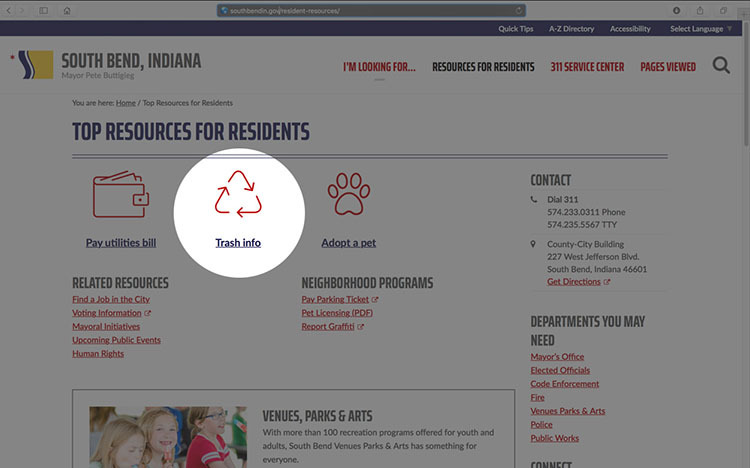 Begin using southbendin.gov. Visit the home page. Any suggestions on how we can make this page better? 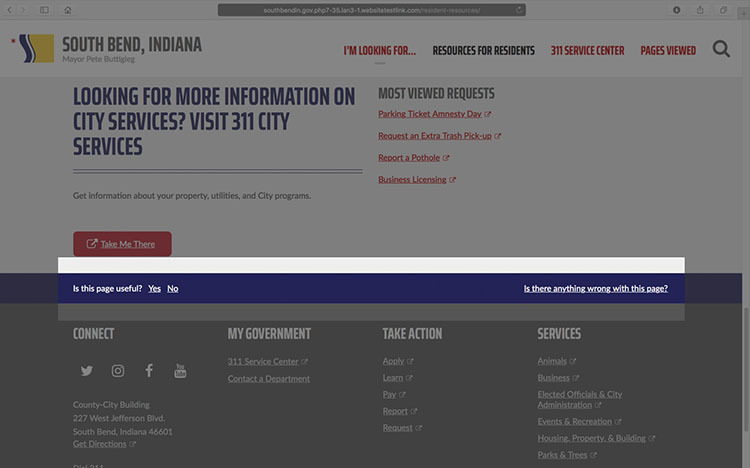 This feedback form is only to report issues with the City of South Bend's website. 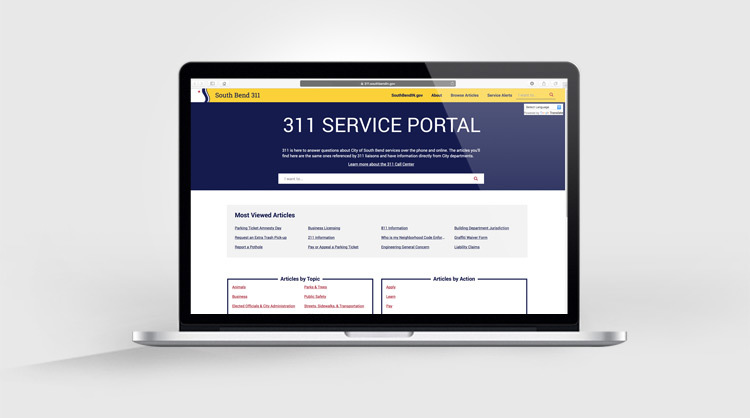 Dial 311 to make a department-specific request or report an issue unrelated to the City's website.